This article is about the World War II army of Germany. For the modern army of Germany and post-World War II army of West Germany also known as the "Heer", see German Army. For the World War I army of Germany, see German Army (German Empire). For other uses, see Heer (army). The German Army (German: Heer, German pronunciation: [ˈheːɐ̯], lit. Army) was the land forces component of the Wehrmacht,[a] the regular German Armed Forces, from 1935 until it was demobilized and later dissolved in August 1946. During World War II, a total of about 13 million soldiers served in the German Army. Germany's army personnel were made up of volunteers and conscripts. Only 17 months after Adolf Hitler announced publicly the rearmament program, the Army reached its projected goal of 36 divisions. During the autumn of 1937 two more corps were formed. In 1938 four additional corps were formed with the inclusion of the five divisions of the Austrian Army after the Anschluss in March. During the period of its expansion under Hitler, the German Army continued to develop concepts pioneered during World War I, combining ground (Heer) and air (Luftwaffe) assets into combined arms forces. Coupled with operational and tactical methods such as encirclements and the "battle of annihilation", the German military managed quick victories in the two initial years of World War II, a new style of warfare described as Blitzkrieg (lightning war) for its speed and destructive power. The Oberkommando des Heeres (OKH) was Germany's Army High Command from 1936 to 1945. In theory the Oberkommando der Wehrmacht (OKW) served as the military General Staff for the German Reich's armed forces, coordinating the Wehrmacht (Army Heer, Navy Kriegsmarine, and the Air Force Luftwaffe) operations. In practice OKW acted in a subordinate role as Hitler's personal military staff, translating his ideas into military plans and orders, and issuing them to the three services. However, as the war progressed the OKW found itself exercising increasing amounts of direct command authority over military units, particularly in the west. This created a situation where by 1943 the OKW was the de facto command of Western Theatre forces while the Army High Command (OKH) was the same on the Eastern Front. The Abwehr was the Army intelligence organization from 1921 to 1944. The term Abwehr (German for "defense", here referring to counter-intelligence) had been created just after World War I as an ostensible concession to Allied demands that Germany's intelligence activities be for defensive purposes only. After 4 February 1938, the Abwehr's name was changed to the Overseas Department/Office in Defence of the Armed Forces High Command (Amt Ausland/Abwehr im Oberkommando der Wehrmacht). Below the army group level forces included Field armies – (see List of World War II military units of Germany), panzer groups, which later became army level formations themselves, corps (see List of German corps in World War II), and divisions (see List of German divisions in World War II). The army used the German term Kampfgruppe which equates to the English 'combat group' or battle group. These provisional combat groupings ranged from an Army Corps size such as Army Detachment Kempf to commands composed of several companies and even platoons. They were named for their commanding officers. German operational doctrine emphasized sweeping pincer and lateral movements meant to destroy the enemy forces as quickly as possible. This approach, referred to as Blitzkrieg, was an operational doctrine instrumental in the success of the offensives in Poland and France. Blitzkrieg has been considered by many historians as having its roots in precepts developed by Fuller, Liddel-Hart and von Seeckt, and even having ancient prototypes practiced by Alexander, Genghis Khan and Napoleon. Recent studies of the Battle of France also suggest that the actions of either Rommel or Guderian or both of them (both had contributed to the theoretical development and early practices of what later became blitzkrieg prior to World War II), ignoring orders of superiors who had never foreseen such spectacular successes and thus prepared much more prudent plans, were conflated into a purposeful doctrine and created the first archetype of blitzkrieg, which then gained a fearsome reputation that dominated the Allied leaders' minds. Thus 'blitzkrieg' was recognised after the fact, and while it became adopted by the Wehrmacht, it never became the official doctrine nor got used to its full potential because only a small part of the Wehrmacht was trained for it and key leaders at the highest levels either focused on only certain aspects or even did not understand what it was. The military strength of the German army was managed through mission-based tactics (Auftragstaktik) (rather than detailed order-based tactics), and an almost proverbial discipline. Once an operation began, whether offensive or defensive, speed in response to changing circumstances was considered more important than careful planning and coordination of new plans. In public opinion, the German military was and is sometimes seen as a high-tech army, since new technologies that were introduced before and during World War II influenced its development of tactical doctrine. These technologies were featured by propaganda, but were often only available in small numbers or late in the war, as overall supplies of raw materials and armaments became low. For example, lacking sufficient motor vehicles to equip more than a small portion of their army, the Germans chose to concentrate the available vehicles in a small number of divisions which were to be fully motorized. The other divisions continued to rely on horses for towing artillery, other heavy equipment and supply-wagons, and the men marched on foot or rode bicycles. At the height of motorization only 20 per cent of all units were fully motorized. The small German contingent fighting in North Africa was fully motorized (relying on horses in the desert was near to impossible because of the need to carry large quantities of water and fodder), but the much larger force invading the Soviet Union in June 1941 numbered only some 150,000 trucks and some 625,000 horses (water was abundant and for many months of the year horses could forage – thus reducing the burden on the supply chain). However, production of new motor vehicles by Germany, even with the exploitation of the industries of occupied countries, could not keep up with the heavy loss of motor vehicles during the winter of 1941–1942. From June 1941 to the end of February 1942 the German forces in the Soviet Union lost some 75,000 trucks to mechanical wear and tear and combat damage – approximately half the number they had at the beginning of the campaign. Most of these were lost during the retreat in the face of the Soviet counter-offensive from December 1941 to February 1942. Another substantial loss was incurred during the defeat of the German 6th Army at Stalingrad in the winter of 1942–1943. So there were periods in which the percentage of motorized units was reduced to as few as 10%. In offensive operations the infantry formations were used to attack more or less simultaneously across a large portion of the front so as to pin the enemy forces ahead of them and draw attention to themselves, while the mobile formations were concentrated to attack only narrow sectors of the front, breaking through to the enemy rear and surrounding him. Some infantry formations followed in the path of the mobile formations, mopping-up, widening the corridor manufactured by the breakthrough attack and solidifying the ring surrounding the enemy formations left behind, and then gradually destroying them in concentric attacks. One of the most significant problems bedeviling German offensives and initially alarming senior commanders was the gap created between the fast-moving "fast formations" and the following infantry, as the infantry were considered a prerequisite for protecting the "fast formations" flanks and rear and enabling supply columns carrying fuel, petrol and ammunition to reach them. In defensive operations the infantry formations were deployed across the front to hold the main defence line and the mobile formations were concentrated in a small number of locations from where they launched focused counter-attacks against enemy forces who had broken through the infantry defence belt. In autumn 1942, at El Alamein, a lack of fuel compelled the German commander Field Marshal Erwin Rommel to scatter his armoured units across the front in battalion-sized concentrations to reduce travel-distances to each sector rather than hold them concentrated in one location. In 1944 Rommel argued that in face of overwhelming Anglo-American air power, the tactic of employing the "fast formations" concentrated was no longer possible because they could no longer actually move quickly enough to reach the threatened locations because of the expected interdiction of all routes by Allied fighter-bombers. He therefore suggested scattering these units across the front just behind the infantry. His commanders and peers, who were less-experienced in the effect of Allied air power, disagreed vehemently with his suggestion, arguing that this would violate the prime principle of concentration of force. It is a myth that the German army in World War II was a mechanized juggernaut as a whole. In 1941, between 74 and 80 percent of their forces were not motorized, relying on railroad for rapid movement and on horse-drawn transport cross country. The percentage of motorization decreased thereafter. In 1944 approximately 85 percent was not motorized. The standard uniform used by the German Army, consisted of a Feldgrau (field grey) tunic and trousers, and was worn with a Stahlhelm. The German Army was demobilized following the unconditional surrender on 8 May 1945. Confronted with a huge number of German prisoners of war after VE Day, the Western Allies kept Feldjägerkommando III, which was a regimental-sized unit of German military police, active and armed to assist with the control of the POWs under the US Army. Feldjägerkommando III remained armed and under Western Allied control until 23 June 1946, when it was finally deactivated. Note: Jörg Wurdack, April 2003  states this date was June 23, 1945. ^ Though "Wehrmacht" is often erroneously used to refer only to the Army, it actually included the Kriegsmarine (Navy) and the Luftwaffe, (Air Force). ^ "WW2 Germany Population, Statistics, and Numbers". www.feldgrau.com. ^ Haskew, Michael. The Wehrmacht: 1923–1945, p 40, 41. ^ Harrison 2002, p. 133. ^ Rice Jr., Earle (2005). Blitzkrieg! Hitler's Lightning War. Mitchell Lane Publishers, Inc. pp. 9, 11. ISBN 9781612286976. ^ Paniccia, Arduino (Jan 14, 2014). Reshaping the Future: Handbook for a new Strategy. Mazzanti Libri - Me Publisher. ISBN 9788898109180. ^ Grossman, DAVID A. Maneuver Warfare in the Light Infantry-The Rommel Model (PDF). p. 3. ^ Lonsdale, David J. (Dec 10, 2007). Alexander the Great: Lessons in Strategy. Routledge. ISBN 9781134244829. ^ Showalter, Dennis (Jan 3, 2006). Patton And Rommel: Men of War in the Twentieth Century. Penguin. ISBN 9781440684685. ^ D. Krause, Michael D.; Phillips, R. Cody (2006). Historical Perspectives of the Operational Art. Government Printing Office. p. 176. ISBN 9780160725647. ^ Stroud, Rick (2013). The Phantom Army of Alamein: The Men Who Hoodwinked Rommel. A&C Black. pp. 33–34. ISBN 9781408831281. ^ Caddick-Adams, Peter (2015). Snow & Steel: The Battle of the Bulge, 1944-45. Oxford University Press. p. 17. ^ Vigor, P.H. (1983). Soviet Blitzkrieg Theory. Springer. p. 96. ISBN 9781349048144. ^ Zabecki, David T. (1999). World War Two in Europe. Taylor & Francis. p. 1175. ISBN 9780824070298. ^ a b CIA 1999, p. 18. ^ Thomas W. Zeiler; Daniel M. DuBois (2012). A Companion to World War II. John Wiley & Sons. pp. 171–172. ISBN 978-1-118-32504-9. ^ Spencer C. Tucker (2009). A Global Chronology of Conflict: From the Ancient World to the Modern Middle East: From the Ancient World to the Modern Middle East. ABC-CLIO. p. 1885. ISBN 978-1-85109-672-5. ^ Williamson & Volstad 1989, p. 13. 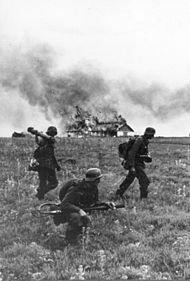 Wikimedia Commons has media related to Heer (Wehrmacht). Davies, W. J. K. (1973), German Army Handbook, Ian Allan Ltd., Shepperton, Surrey, ISBN 0-7110-0290-8. Evans, Anthony A. (2005), World War II: An Illustrated Miscellany, Worth Press, ISBN 1-84567-681-5. Haskew, Michael (2011), The Wehrmacht: 1935–1945, Amber Books Ltd. ISBN 1-907446-95-8. Harrison, Gordon A. The Cross Channel Attack (Publication 7-4). Retrieved July 9, 2016. Hastings, Max (1999) , Overlord: D-Day and the Battle for Normandy 1944, Pan, ISBN 0-330-39012-0. Hastings, Max (2004), Armageddon: The Battle for Germany 1945, Macmillan, ISBN 0-333-90836-8. Keegan, John (1982), Six Armies in Normandy, Viking Press ISBN 978-0670647361. Williamson, Gordon; Volstad, Ron (1989). German Military Police Units 1939–45. London: Osprey Publishing. ISBN 0-85045-902-8. "The Role of the German Army during the Holocaust: A Brief Summary. ": Video on YouTube—lecture by Geoffrey P. Megargee, via the official channel of the United States Holocaust Memorial Museum.